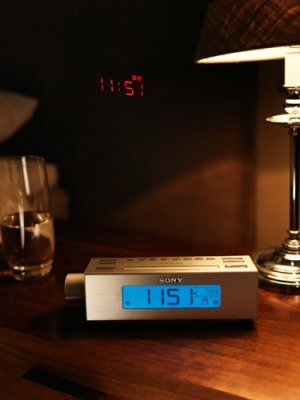 Sony announced a new clock radio today, the enticing named ICF-C717PJ, the latest in a long line of consumer electronics. The ICF-C717PJ has a few tricks up it’s proverbial sleeve however, including a thermometer and the ability to project the time on the wall or ceiling. The ICF-C717PJ can also show you the room temperature, and has five pre-programmed nature sounds to help you fall asleep faster. As far as waking up, the ICF-C717PJ gives you the choice of AM/FM, a buzzer, or music from your MP3 player. You can also chose to listen to nature sounds and wake to either the undersea world, waves, a mountain brook, or birdsong. If you’re looking for the ICF-C717PJ in the US, you’re going to be disappointed right now; it’s initially planned to only be available in Europe. Sony also has yet to name a price at this time.